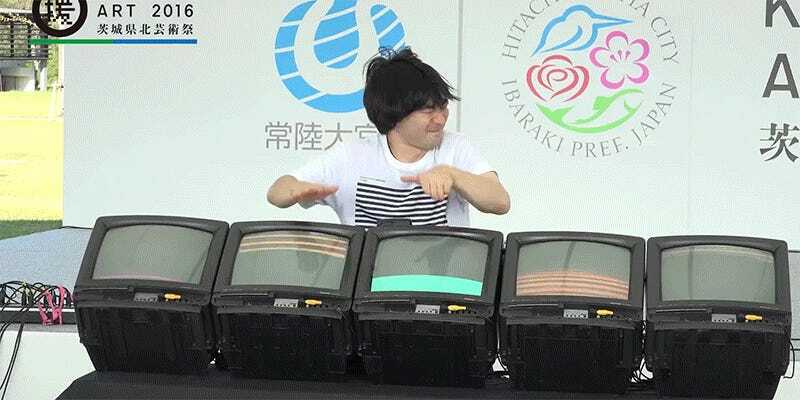 Japanese artist Ei Wada specializes in turning old consumer electronics into new musical instruments. He’s rigged up old CRT TVs to simultaneously function like bongos, transformed AM/FM radios to squeal like a theremin, and converted a busted office fan into a wailing guitar. That and more, it all seems to bring him endless joy. In a Japanese language article about his work, this Google-translated selection seems to perfectly describe what goes down at an Ei Wada show: “If happen to be place where such performance has been expressed, will fill the chest with indescribable feelings.” He says, “Oh, I think I was born to do this I music.” You can tell. Watch the master do his thing in three performances from the Kenpoku Art Festival below. Even if the music isn’t your cup of tea, his energy is infectious and I want one of those beautiful glitchy TVs.